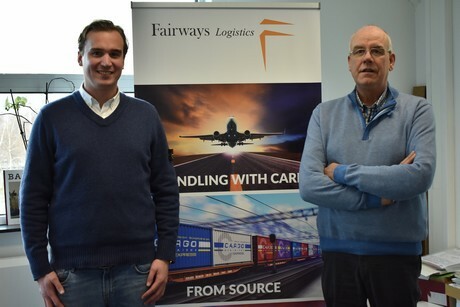 Fairways Logistics recently announced a partnership with the Japanese company Kintetsu World Express (KWE). Unlike Fairways, which has been in existence for 20 years but is relatively modest in size, KWE operates worldwide in land, sea and air transport. We spoke to Hans Blauw, who's worked at the company for a year now and with Matthijs Verweij, Sales Executive Benelux at KWE. Globally, the transport sector in perishables is dominated by a few giants such as Kuehne Nagel and Panalpina, but there is room for smaller companies according to Hans. "Exports of goods are growing worldwide and the demand for flexible and, above all, reliable logistics partners is growing. There are opportunities for smaller companies here, because they can often operate more flexibly and rapidly due to their size." According to Hans, a company like Fairways Logistics can do this like none other. "If people call us with a rush shipment your order won't end up in a pile, as is the case with large companies. To give you an example: a grower who was unknown to me just called, needing to ship 20 tons of potatoes from Europe to Canada at the very last minute. At such a moment we jumped out of our seats and we arranged that. Quick action, flexibility and personal contact is what we are committed to and how we can distinguish ourselves from the larger players." Despite these advantages, Fairways Logistics joined forces with KWE. They can of course benefit from the operational strength and the network of each other. Kintetsu World Express, part of the Japanese Kintetsu Group Holdings (which also owns Kintetsu Railways) and since 1948 active in land, air and sea transport, wants to expand in perishables and can benefit from the market experience Fairways has. "At KWE, around 20,000 people work worldwide, the company has annual revenues of over $ 5 billion, and we have knowledge and operational strength," says Matthijs. "But in perishables we don't know the way everywhere. Someone like Hans, who has been in this market for 40 years and knows the entrance everywhere, does have this, and we can already conclude that this cooperation is more than paying off." Fairways currently handles many fruits and vegetables from Mexico. For floriculture, there are also many customers who buy cut flowers. Most of the flowers come from Ecuador and Kenya, however. Fairways has offices in the Netherlands, Miami and Kenya. In collaboration with KWE, an additional 10,000m2 of cool storage will be taken into use early next year, bringing the total to 23,000m2. Kintetsu World Express (Benelux) B.V.